As wearable devices that track your movements become more popular for adults, LeapFrog launch their amazing LeapBand for kids. By awarding points for undertaking various activities, kids are encouraged to take some form of physical exertion every day. Coupled with a full colour screen that also presents them with a virtual pet to take care off, LeapBand can also be used for playing a variety of fun games. Built in features include an accelerometer, a water resistant casing, a rechargeable battery and a choice of displaying the watch as analogue or digital. Children can also download the Petathlon app for free onto their LeapPad Ultra for a range of extra games like surfing or archery. Eight different virtual pets such as monkey, penguin or dog are fully customisable by colour or name. 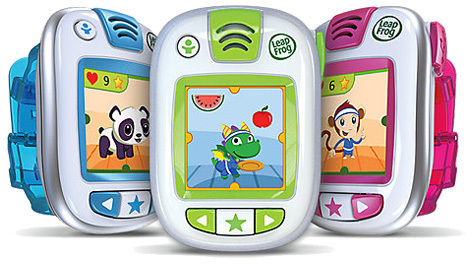 Please tell us what you think of the LeapFrog LeapBand by LeapFrog.